We all eat for emotional reasons some of the time. Let’s face it: food is convenient, pleasurable and exciting. It can also be comforting and soothing. And eating is a way to distract ourselves from dealing with the things we don’t want to deal with, right? Generally, we’re not bothered by a little emotional eating here and there, unless we’re overweight or our health is at risk. If you’re like most of the people that attend my seminars, workshops and 12 Week Emotional Eating Recovery Program, you’re concerned about your weight and your health. You’ve lost weight many times but always seem to gain it back. You’ve tried all kinds of diets, eating plans and exercise regimens–perhaps you’ve even tried pills, shots and surgery. You may already be suffering from health conditions, like diabetes and hypertension, related to your weight. You’re probably frustrated and feel somewhat hopeless about keeping weight off. Perhaps you believe you overeat just because you love food and eating and because there is an overabundance of delectable food everywhere. Or you’re overweight because of bad genes. Maybe you believe that you lack willpower and label yourself as lazy or undisciplined with respect primarily to eating and exercise. 1) dull the pain of unpleasant emotions like sadness, anger, depression, rejection, hurt, dissatisfaction, hopelessness, and powerlessness. 2) soothe and comfort yourself when feeling anxious, afraid, worried and overwhelmed. 3) to fill up an inner emptiness and loneliness. 4) to distract from a sense of powerlessness to change your self or your life circumstances. 5) to make up for the deprivation of the past by having no limits today. 6) to procrastinate and put off unpleasant or difficult tasks. 7) to stuff down the pain of limiting, negative, self-defeating thoughts. 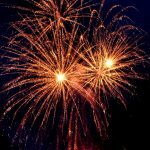 8) to rebel against powerful others from your past and assert your independence. 9) to avoid taking risks and protect yourself from further disappointment. 10) to avoid dealing with sexuality–using your weight as an excuse not to date or be physically intimate; keeping yourself overweight to limit sexual attractiveness. The truth is, if you regularly eat when you’re not hungry or when you’re already full, or if you regularly choose to eat unhealthy comfort foods, the bulk of your overeating is not just because you love food and enjoy eating, have bad genes or are lazy and undisciplined. 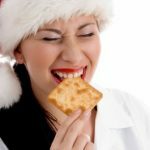 Your overeating may be a sign that you are lacking the self-care skills needed to regulate your behavior, resolve your emotional issues and put an end to overeating. 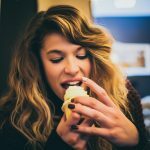 The good news is that you can stop emotional eating by addressing these unresolved issues and building the missing or poorly developed self-care skills. It will take time to do this but truly, there is no rush. 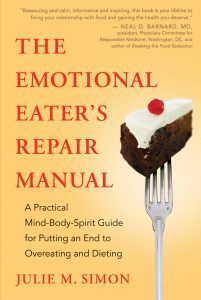 You didn’t become an emotional eater overnight and your overeating will not be resolved overnight. For a period of time, perhaps a couple of months, see if you can focus on gaining skills, rather than losing weight. 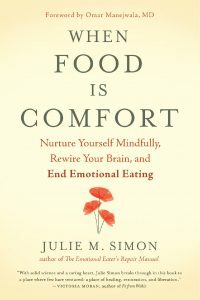 The next time you feel like eating when you’re not physically hungry, turn inward for a moment, connect with yourself and ask yourself: “What am I feeling?” and “What am I truly hungry for? 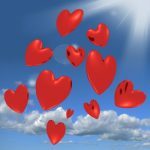 Or what am I longing for?” Research shows that just the act of writing down what we feel and need can regulate our nervous system and lead to behavioral change. You might be surprised by the answers. You may not be able to meet this need immediately, but remind yourself that overeating won’t get you any closer to your goal either. In this moment, is there some other way you could take care of yourself? The moment when the urge to “use” food is strong is an opportunity to practice and build new self-care skills. Yes, you may feel somewhat unfulfilled and a bit uncomfortable, but think about how uncomfortable you already are with the extra weight and chronic self-disappointment. You’ll feel better about yourself if you push away from the food and nourish yourself in some other way. The more-than-great news is that every time you practice this new skill, you’re “wiring-in” new neural patterns. As you “rewire” your brain, it will get easier to set limits with yourself in the future. Just take it one baby step at a time.